We are without a car for the next 10 days. Our beloved “Eidelweiss” was scheduled to get a new compressor, but as the mechanics found out as they began to replace it, another part was needed. I bought parts at a Honda dealer in the USA because we have an American car. The parts are much cheaper there, and the guys here in Belgrade, kindly gave me a list of parts to buy. They overlooked a part, hence they are ordering a new one. We’ll be without a car for a while. We also found out the car was low on oil after the long holiday. We needed a tow truck coming back from the airport last Friday evening. 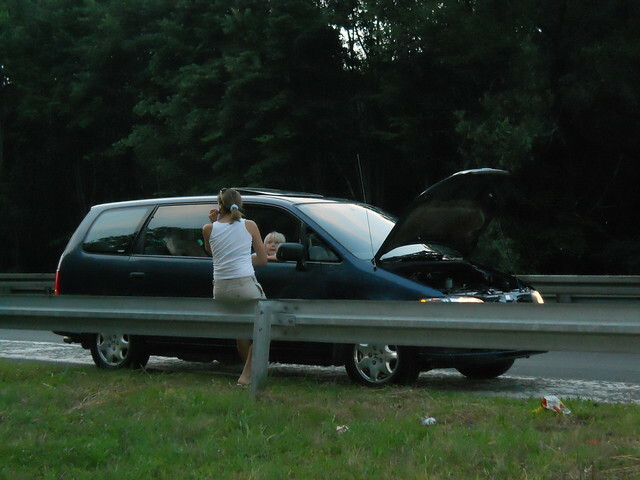 Nadia is shown above calling as we pulled over on E75. It is doubly inconvenient because Nadia’s sister and my nephew are visiting and it would be nice to have a car. I’ve been working this week and Nadia and the kids have been going to Ada and biking and swimming.